Jubilee® Clips – “The finest hose clip in the world” – have introduced new packaging for their range of Original Jubilee® worm drive hose clips. New boxes for sizes 000 (9.5-12mm diameter) to 3 (55-70m diameter) now display all the relevant technical data on the side of each box, making it much easier for customers to choose the correct clips for their application. 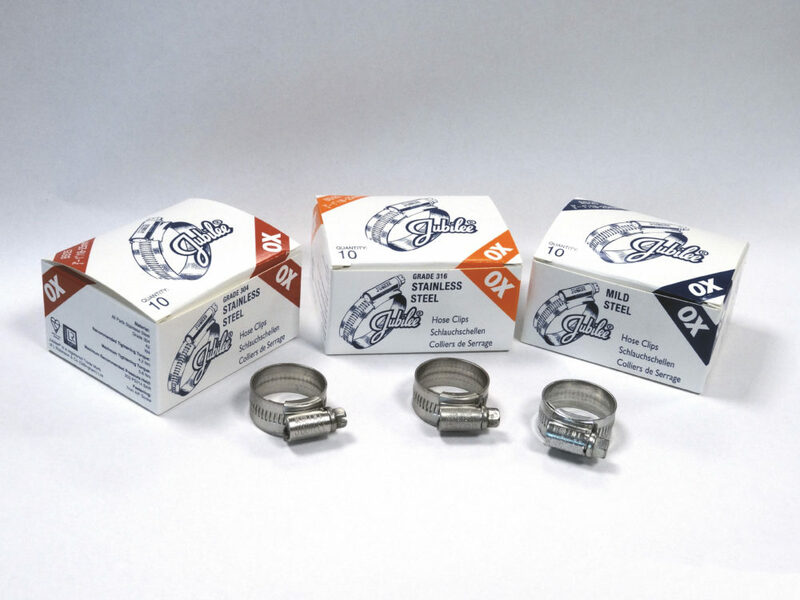 The most obvious changes are visible on the boxes for Jubilee’s stainless steel Original Range of hose clips, which are now two-tone, with the iconic ‘Jubilee® Clips’ logo kept in blue, along with the relevant technical data making it more legible. The top of the range 316 stainless steel Original Jubilee® Clips boxes have received a total makeover and now have bright orange flashes, distinguishing the boxes from the 304 stainless steel range with their red flashes, but still showing the close relationship between the two grades of stainless steel hose clips by having a closely related colour scheme. Parallel to the brand new range of boxes, Jubilee® Clips have begun rolling out new look poly-bags for their Original Range hose clips in larger sizes, as well as for all Jubilee® High Torque clips, Jubilee® Superclamps, Jubilee® Quick Release straps, Jubilee® Juniors, Jubilee® Wingspades, Jubilee® P-Clips and Jubilee® O-Clips. The new poly-bags feature standard Euro-slots for hanging a wide range of Jubilee® products on a Euro Hook display. The classic ‘Jubilee® Clips’ logo is printed on each bag, alongside the product relevant information and EAN code on the front and a list of the different ranges of hose clips that Jubilee® Clips offer on the rear of the bag.